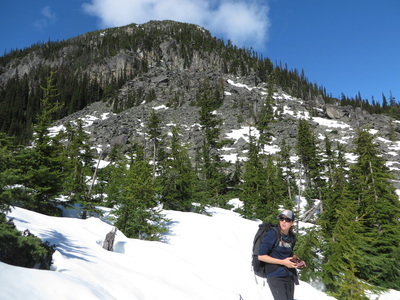 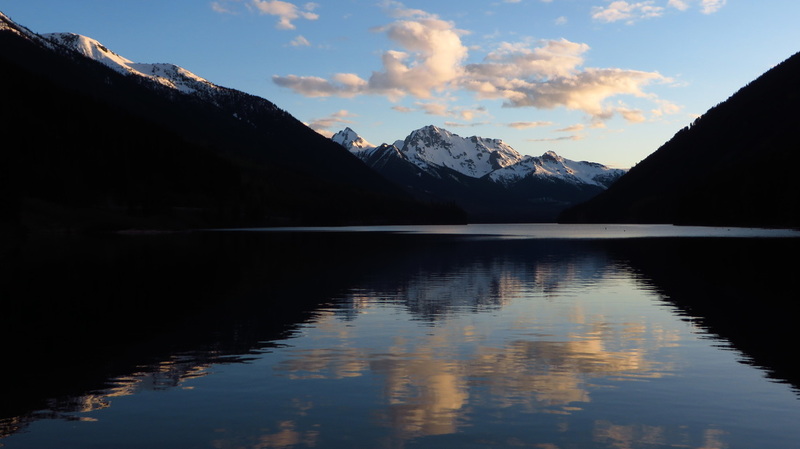 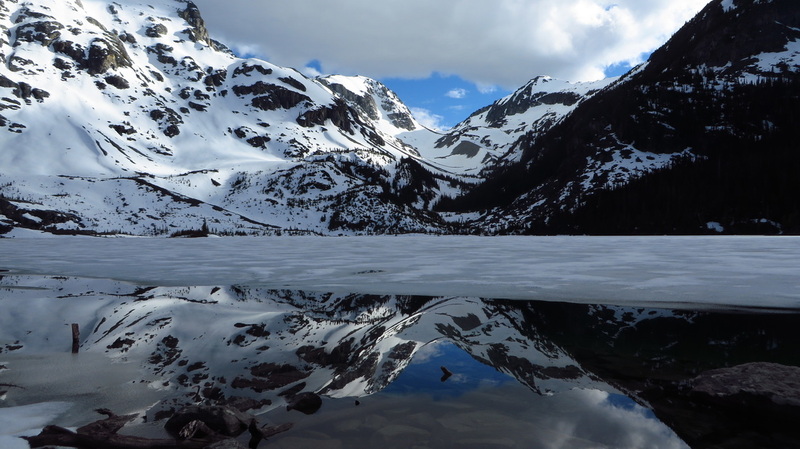 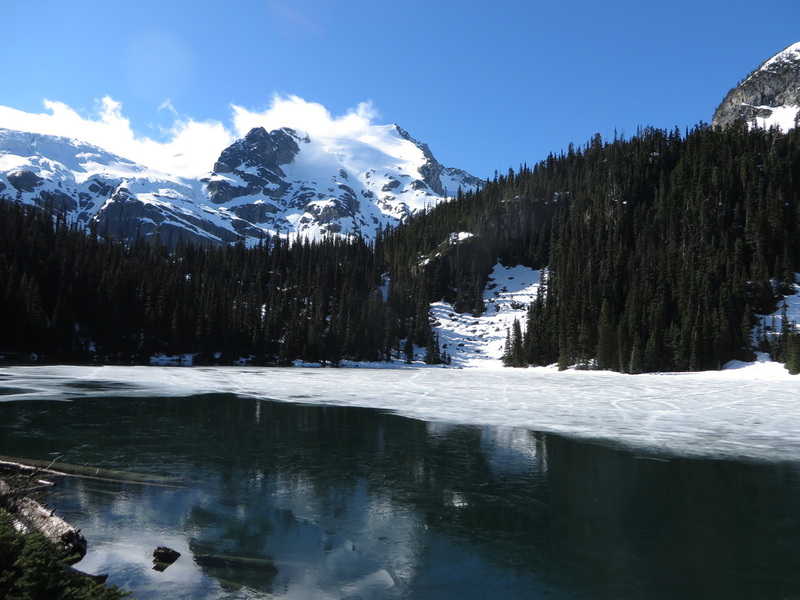 Sarah (a friend from Colorado) and I began our road trip up to Alaska just a couple days after I hiked Mount Forgotten and our first stop once we got into Canada was the Joffre Lakes Provincial Park. 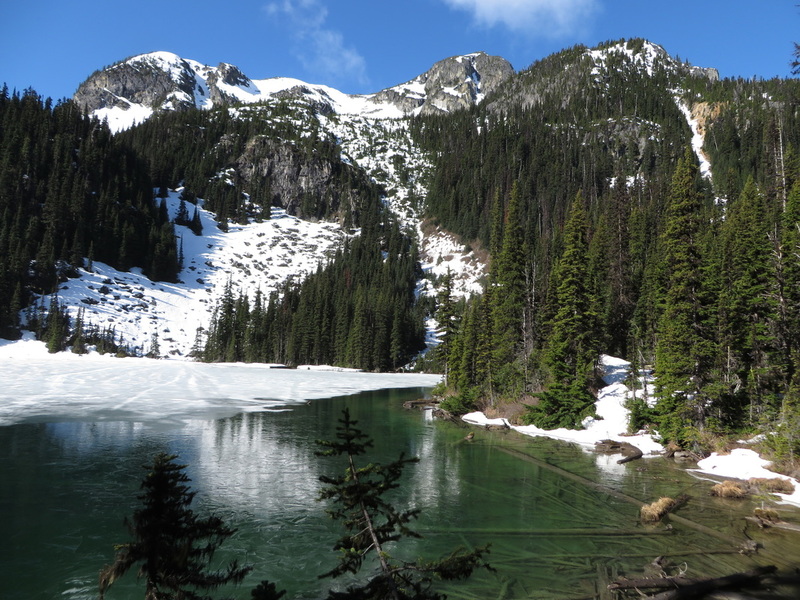 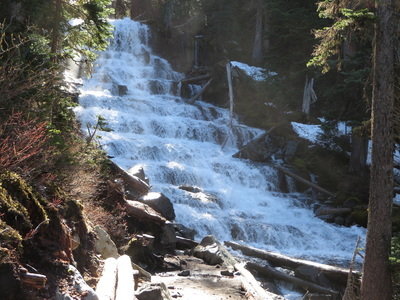 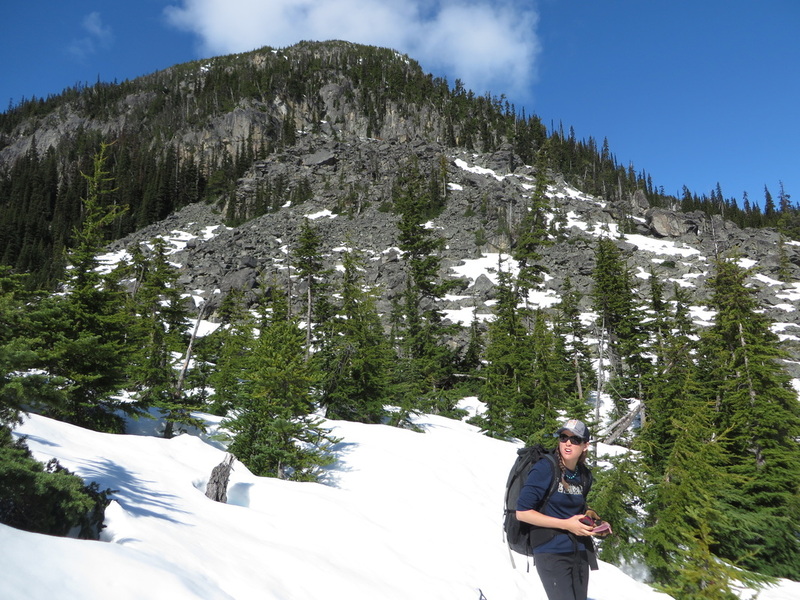 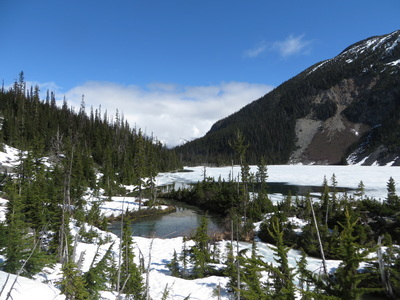 We camped for the night at the trailhead and woke up early the next morning and started up the Joffre Lakes Trail. 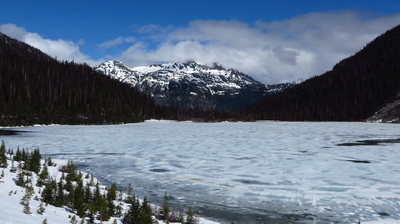 We hit snow pretty quickly from the start and after just an hour and a half made it to the upper lake, which was still completely frozen over. 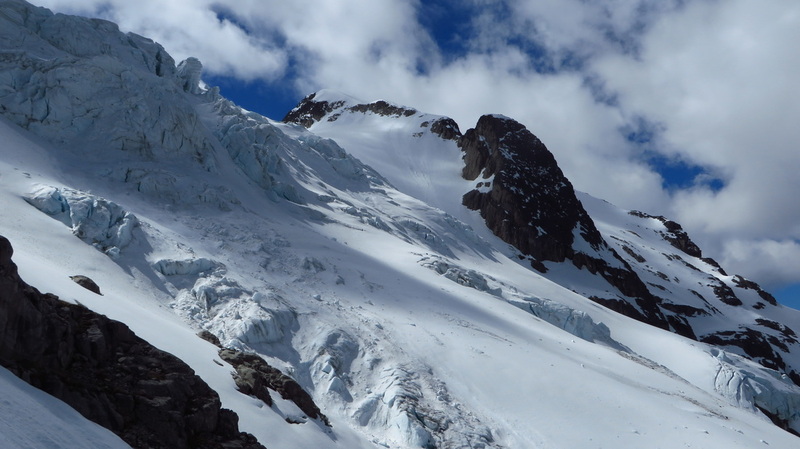 We decided to hike around its right side and spotted a route up to the glacier above making a leftward ascending traverse above the lake. 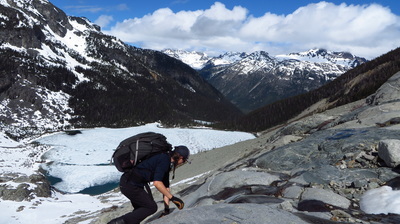 We took advantage of some bare rock slabs giving us a rest from the postholing. 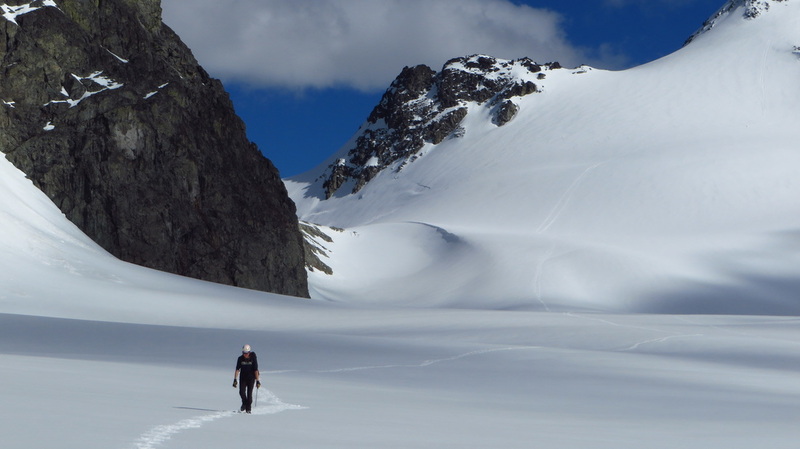 Once we topped out onto the glacier, the terrain flattened out significantly as we walked on the edge of the glacier and roped up. 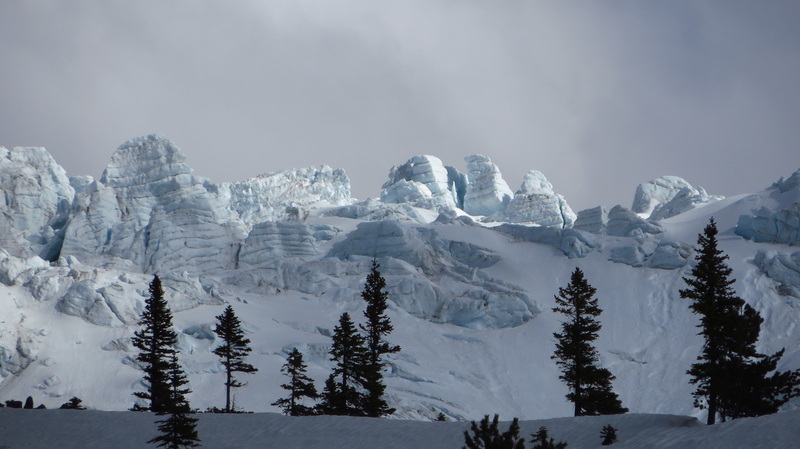 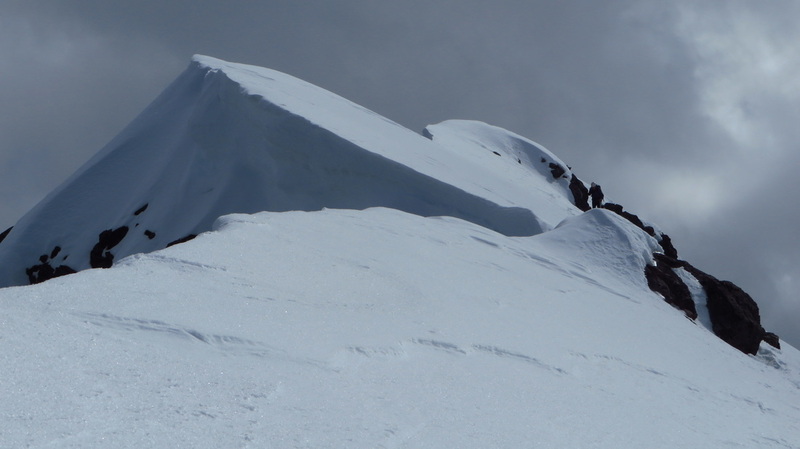 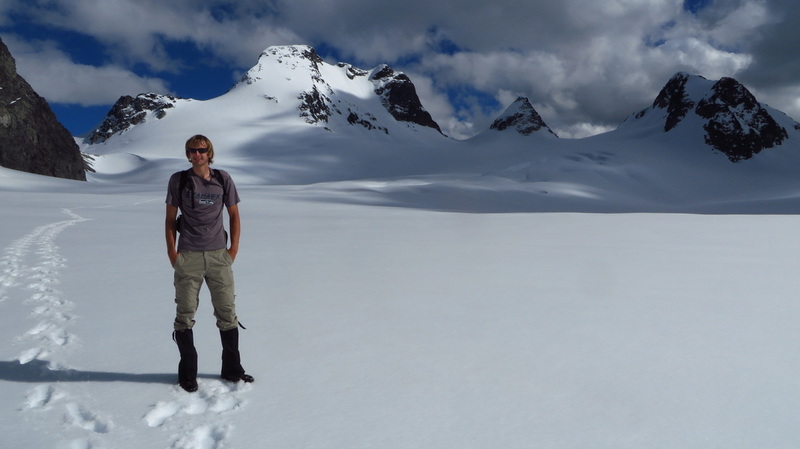 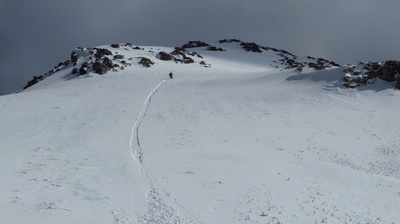 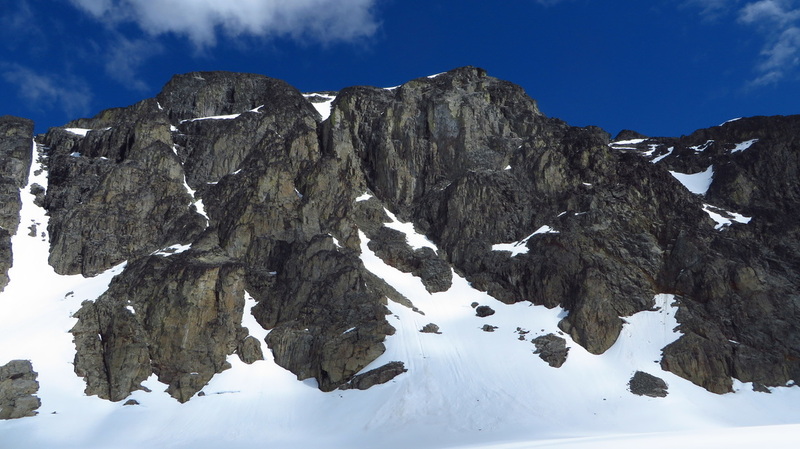 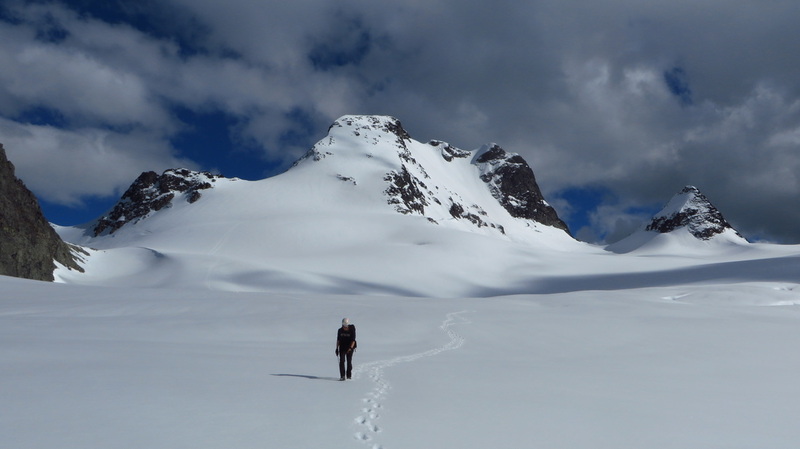 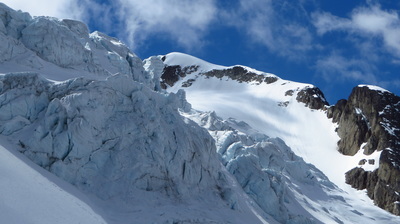 There were no crevasses in sight as the whole glacier appeared like one flat blanket of white (see banner photo above). 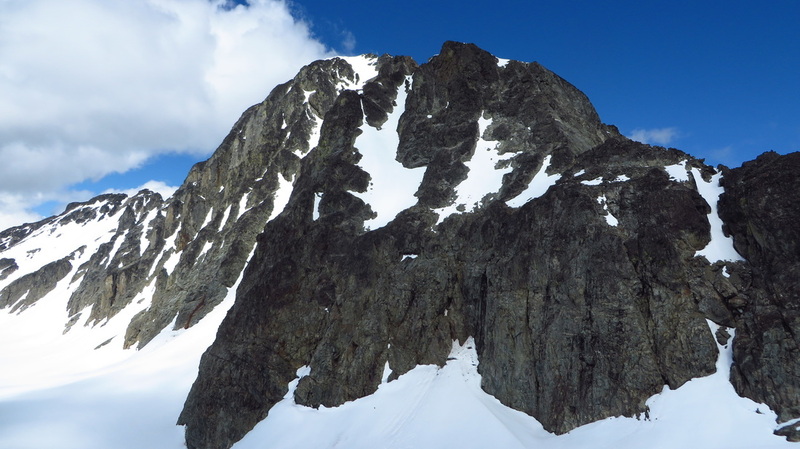 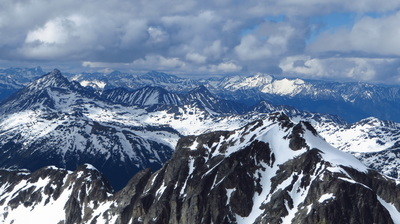 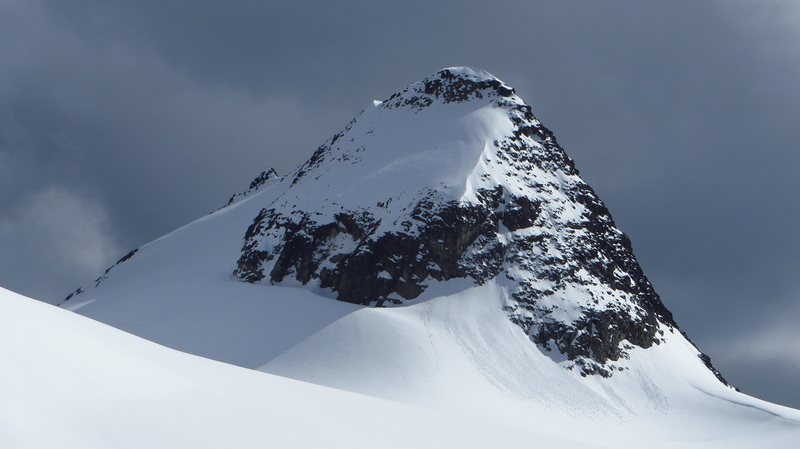 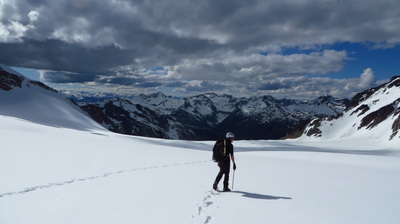 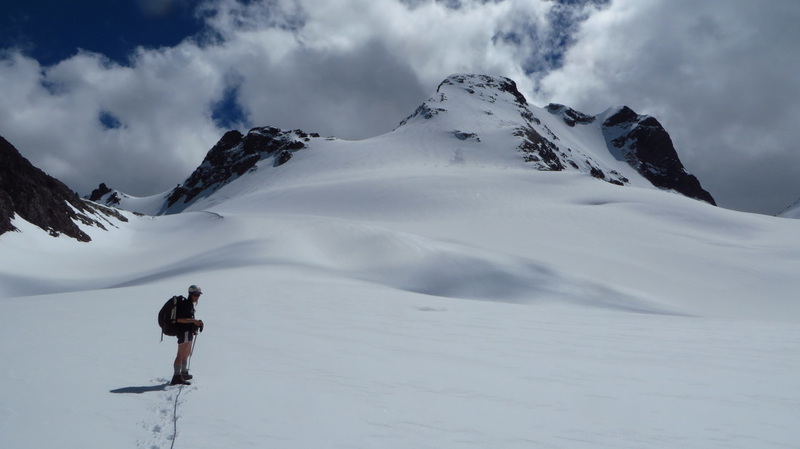 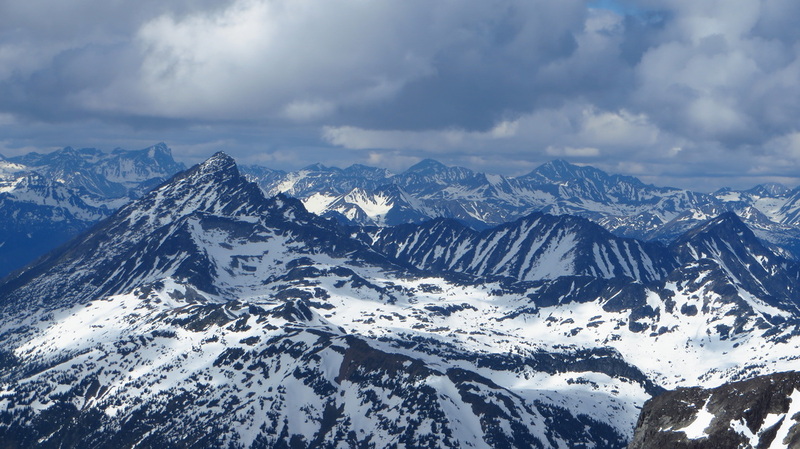 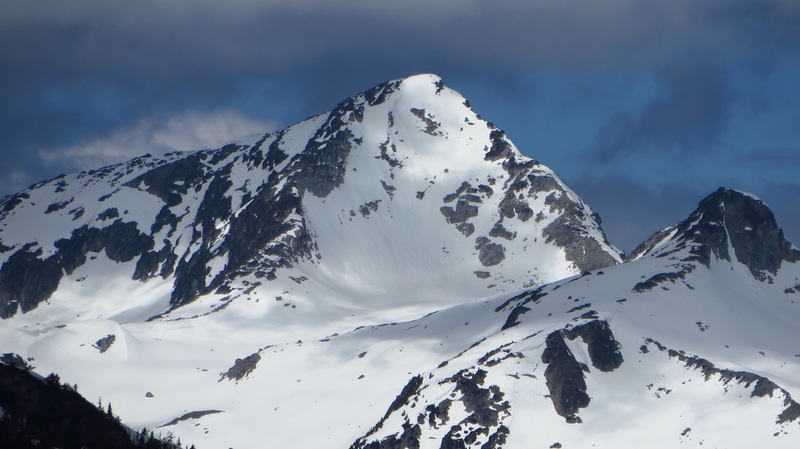 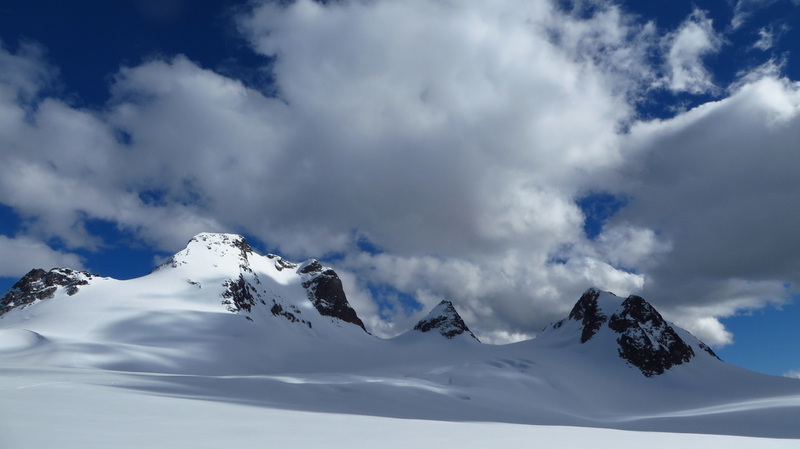 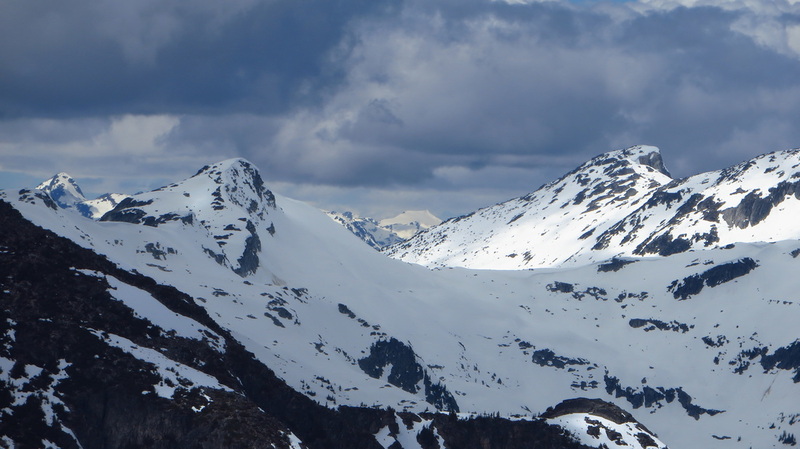 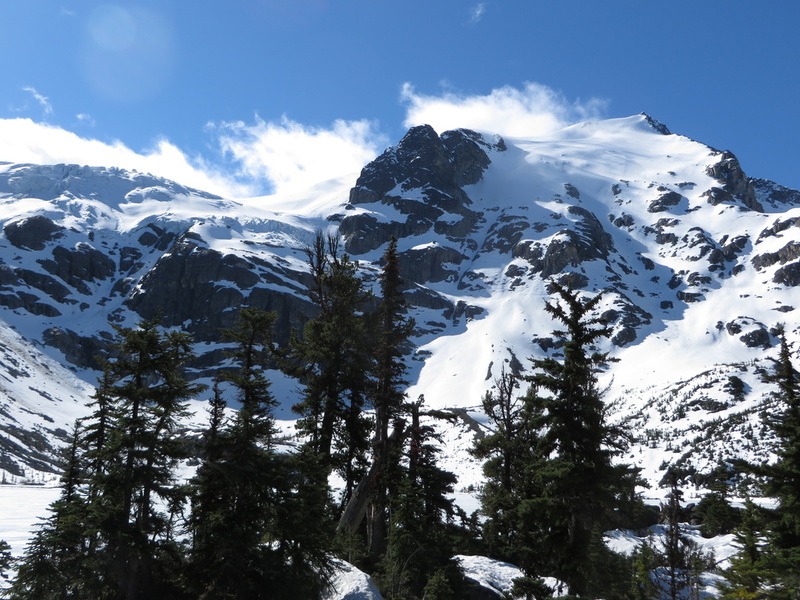 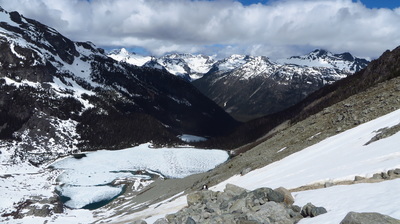 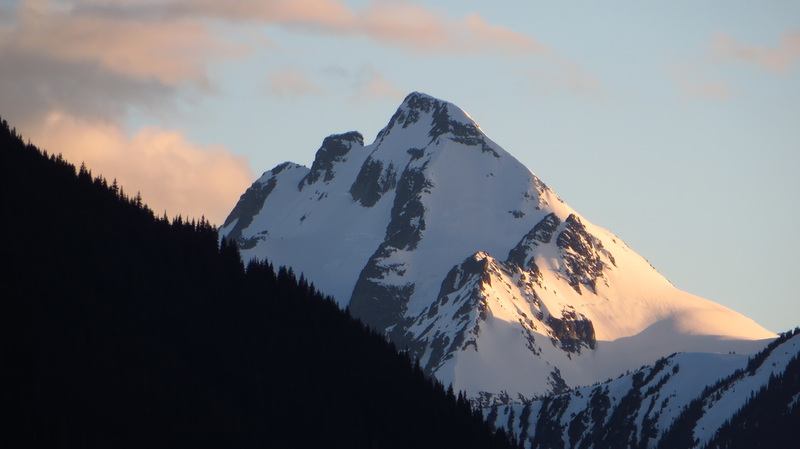 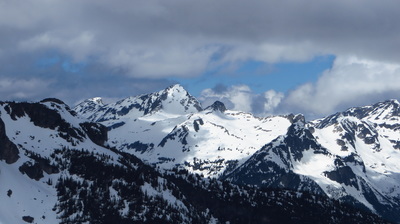 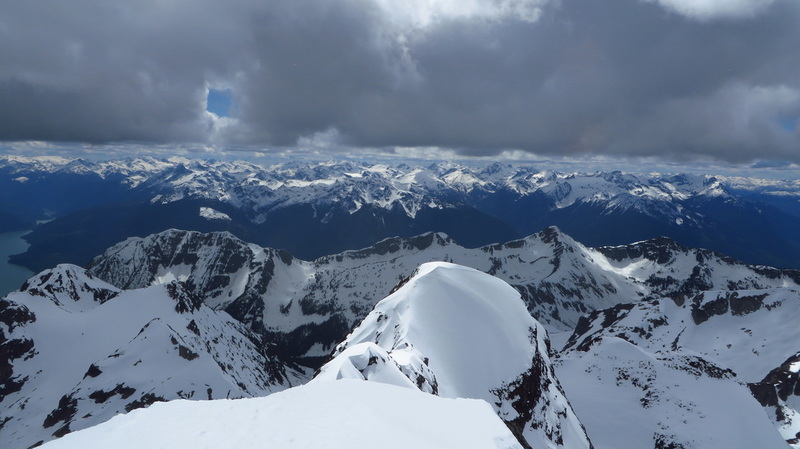 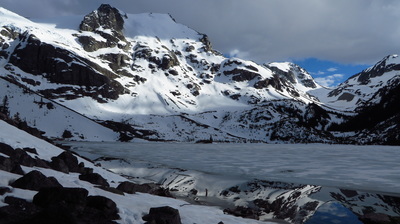 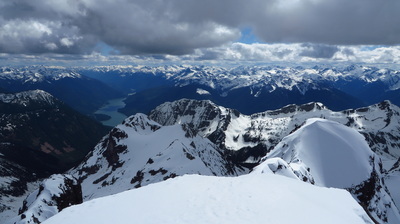 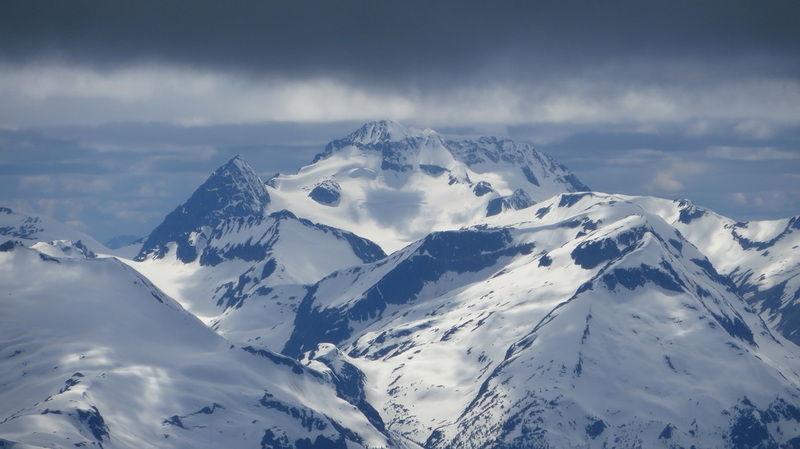 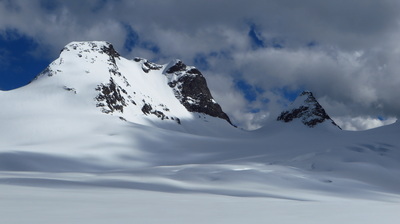 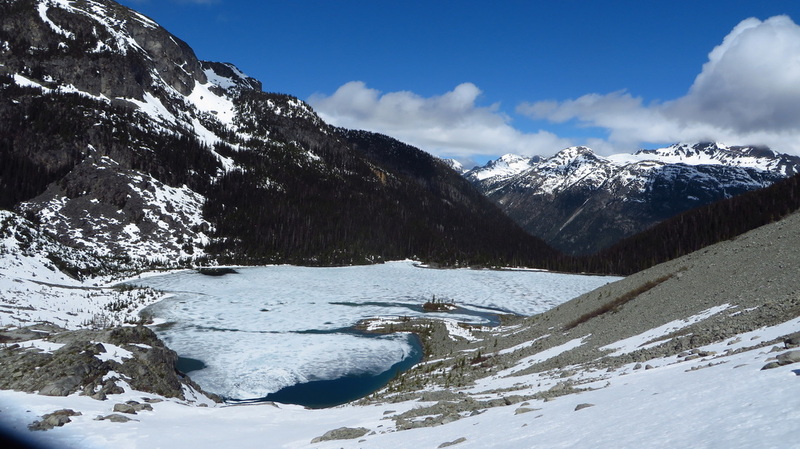 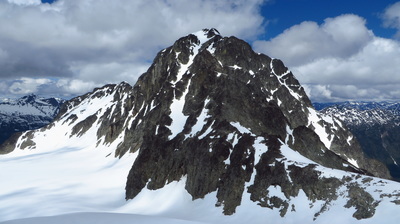 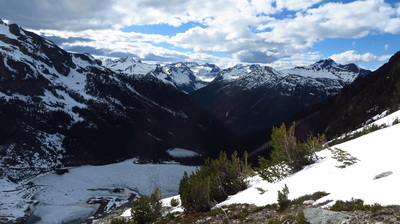 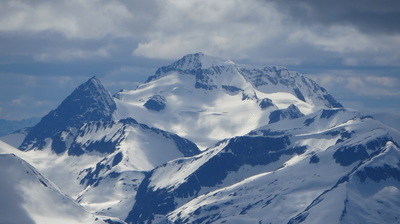 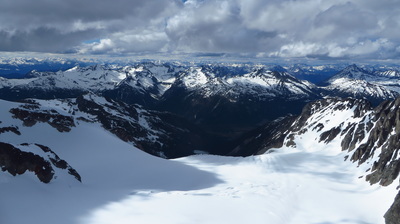 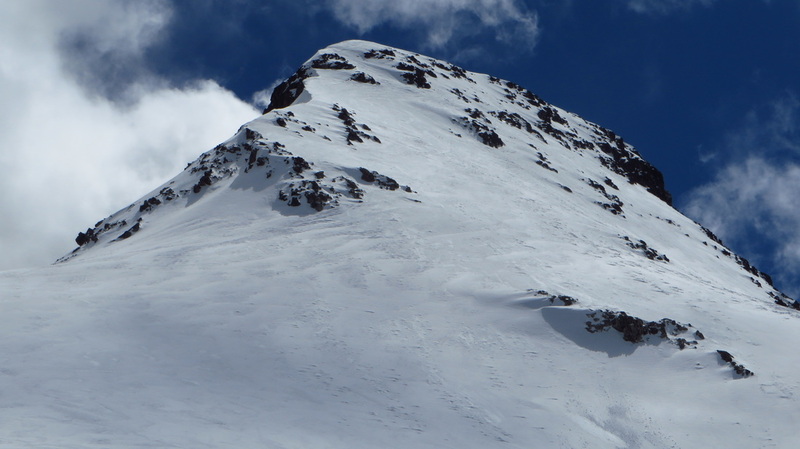 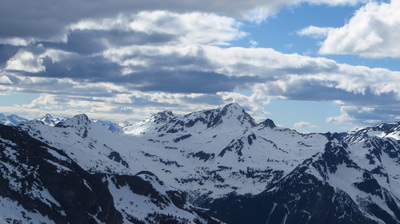 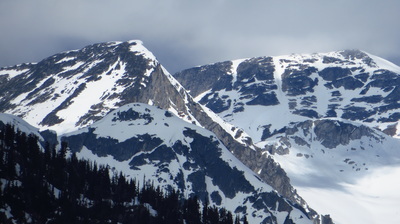 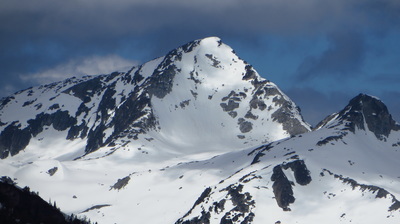 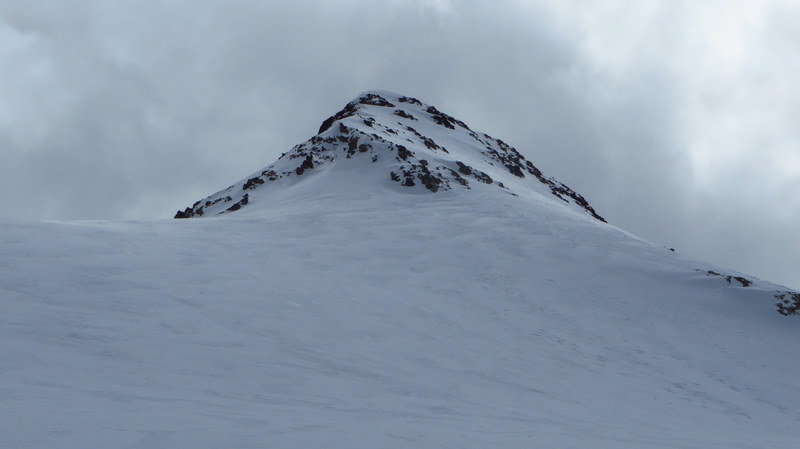 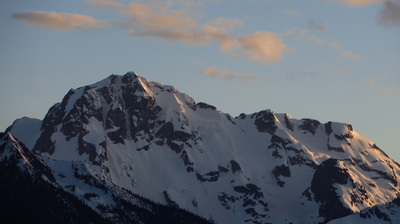 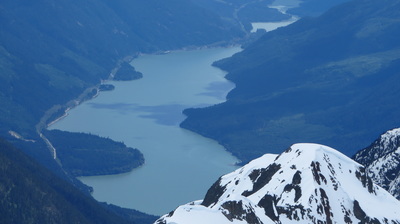 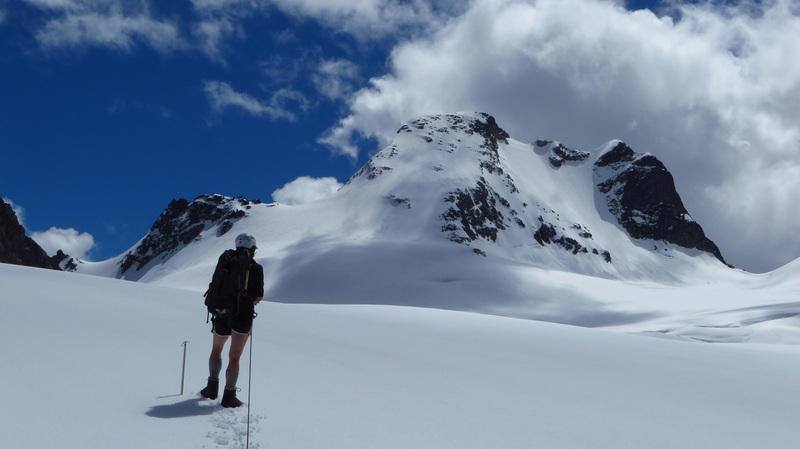 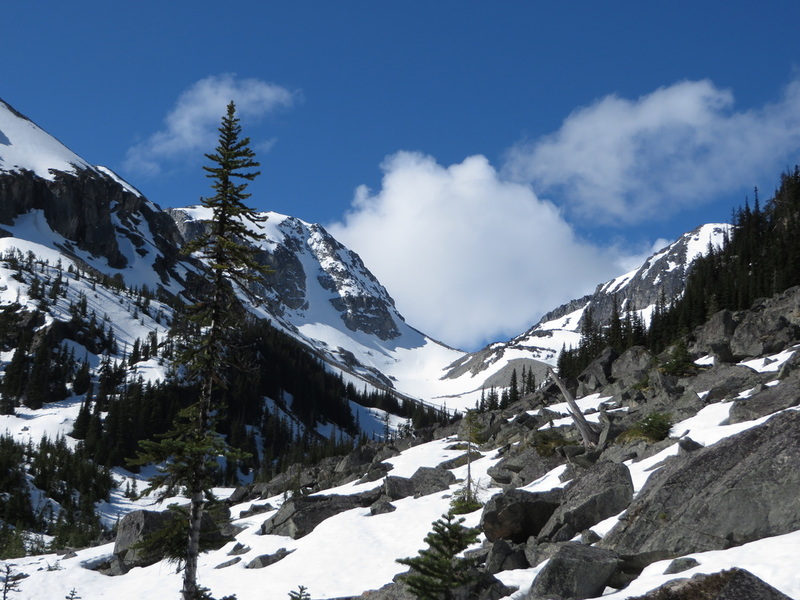 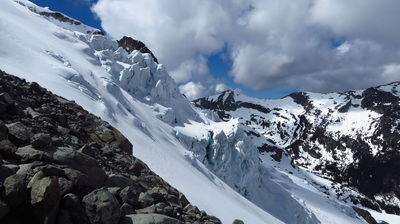 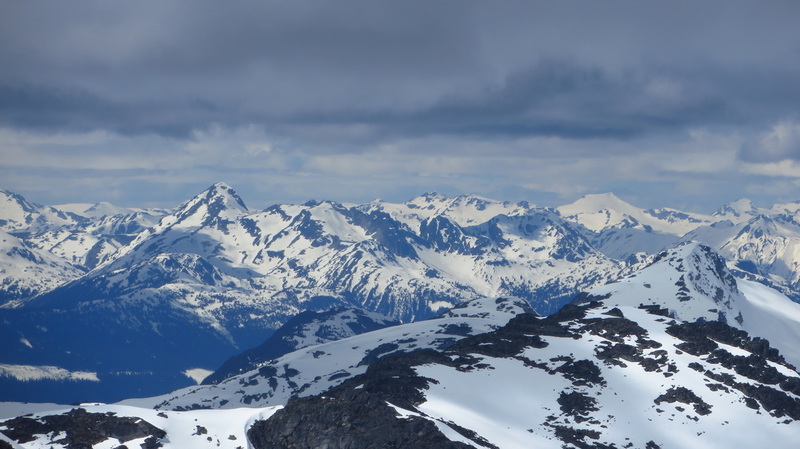 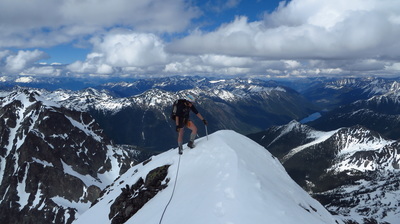 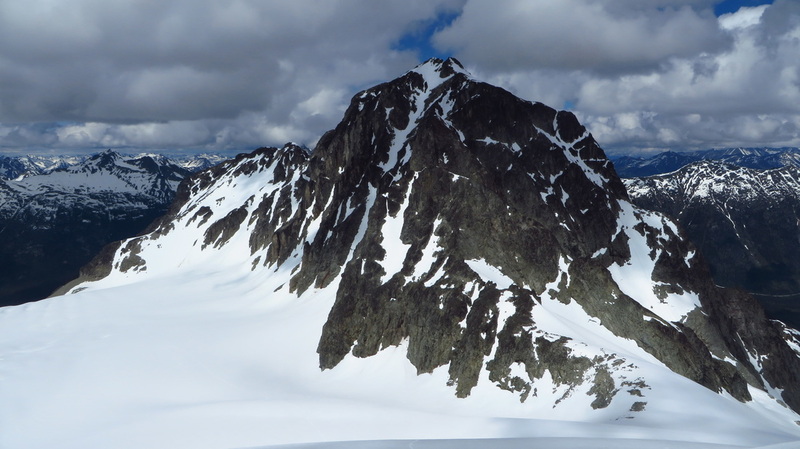 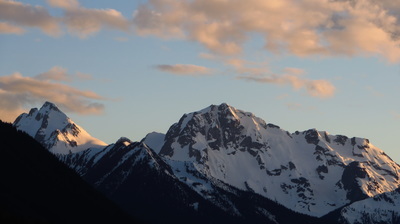 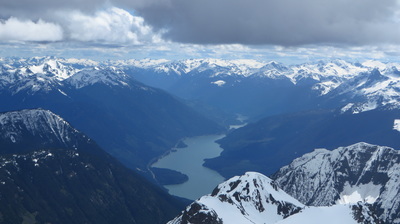 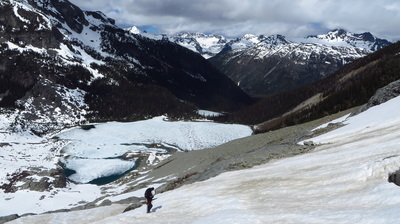 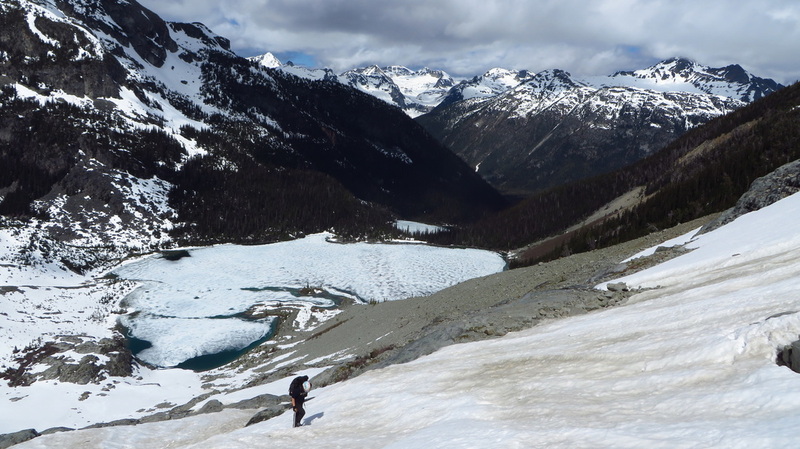 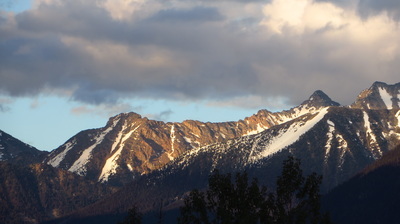 Mount Matier loomed above at the head of the glacier. 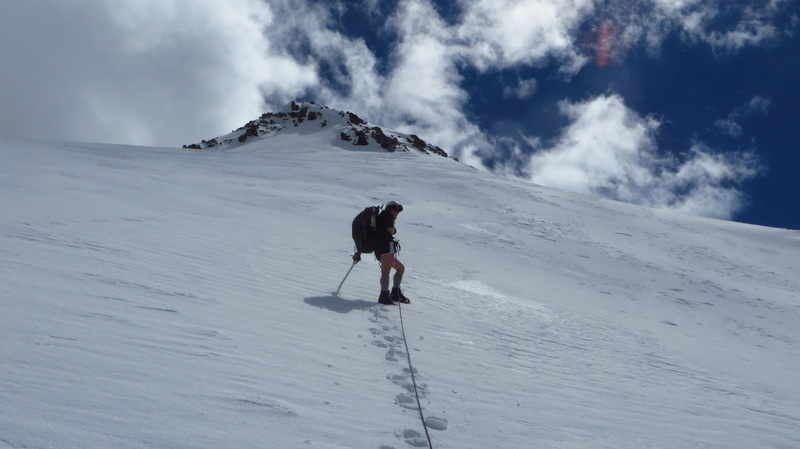 It was a long, hot slog across, as the relentless sun beamed down on us the entire way. It took an hour to cross the glacier and when the terrain steepened, the snow got a bit harder. Sarah started kicking steps since she had actual mountaineering boots on compared to my leather hiking boots. 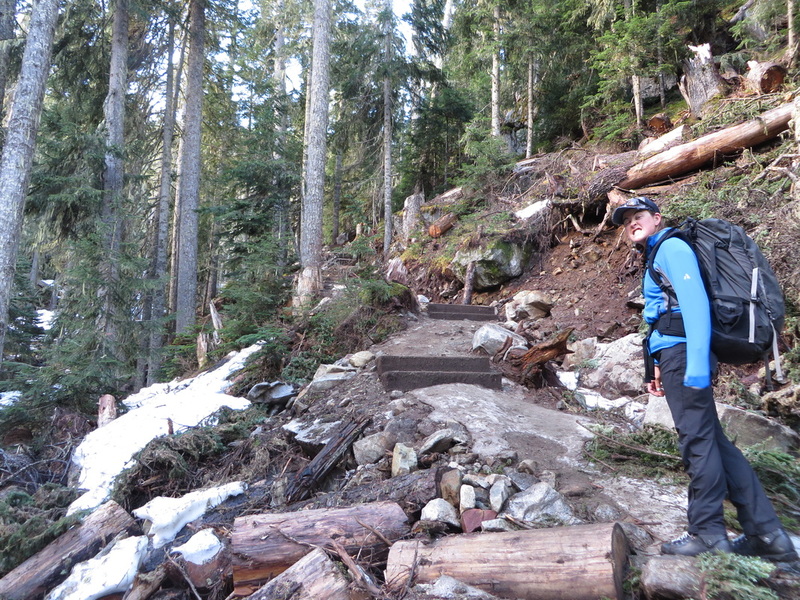 Halfway up the final 800 feet I continued up and was able to kick steps into the 45 degree slope. 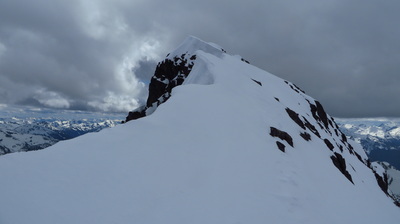 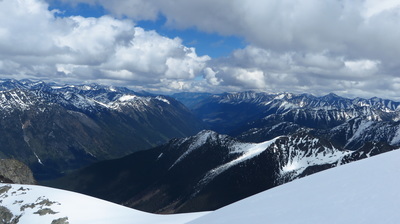 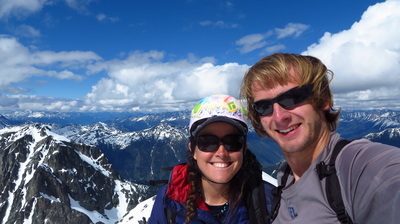 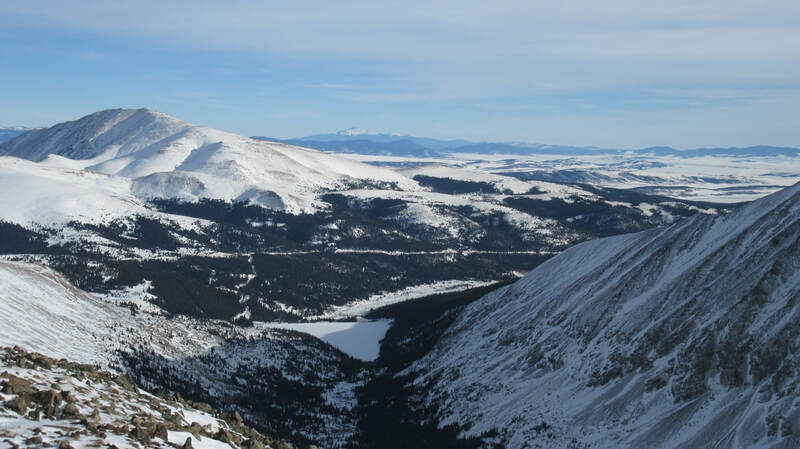 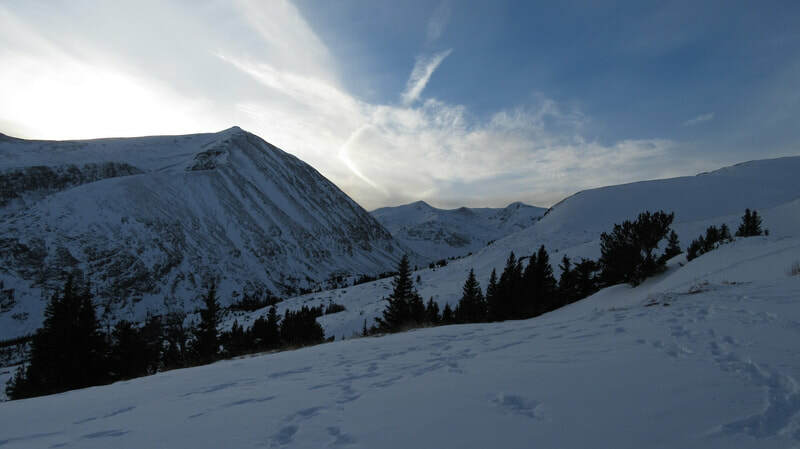 We made it to the summit ridge and traversed a short distance to the highest point where one of the grandest views I have ever seen greeted us. 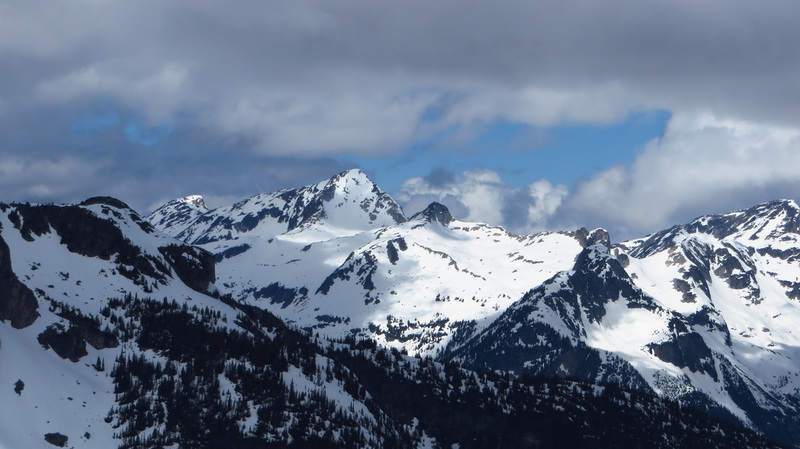 I remember commenting how it looked a lot like the North Cascades as it was much snowier to our west and drier in the east, with Highway 99 snaking through the valleys below us (reminded me of the North Cascades Highway). We stayed on the summit nearly an hour enjoying the view which I would never forget. 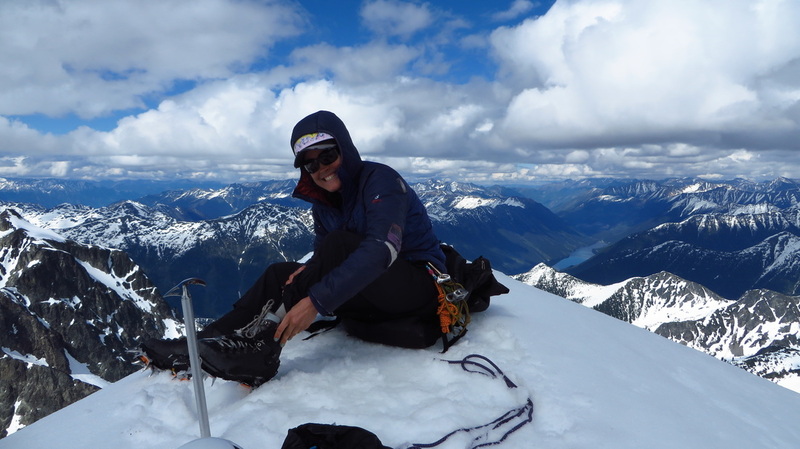 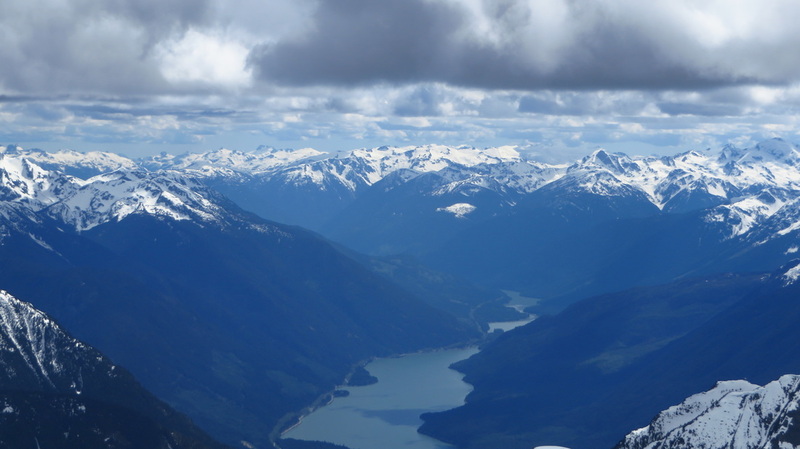 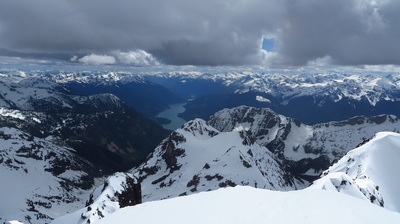 This was also my first summit in Canada I attained so it's extra special. 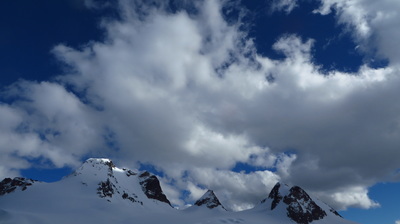 there were a perfect amount of clouds in the sky to make it extra photogenic, and I took many photos. 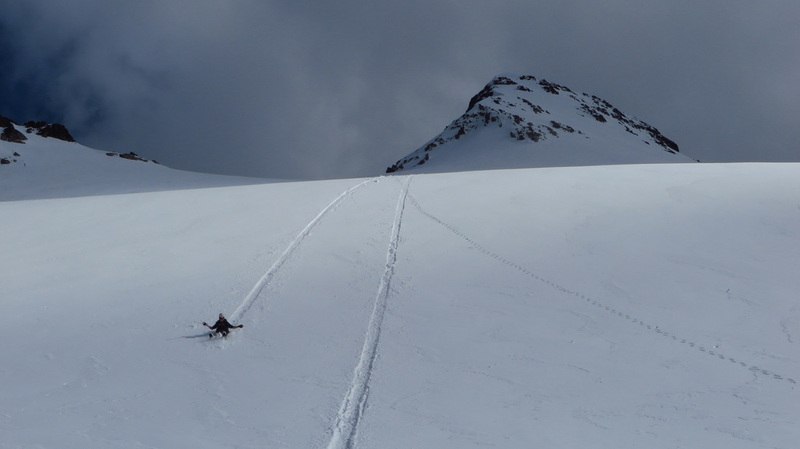 Once we had our fill, we were able to glissade most of the way down the upper mountain back to the flat part of the glacier. 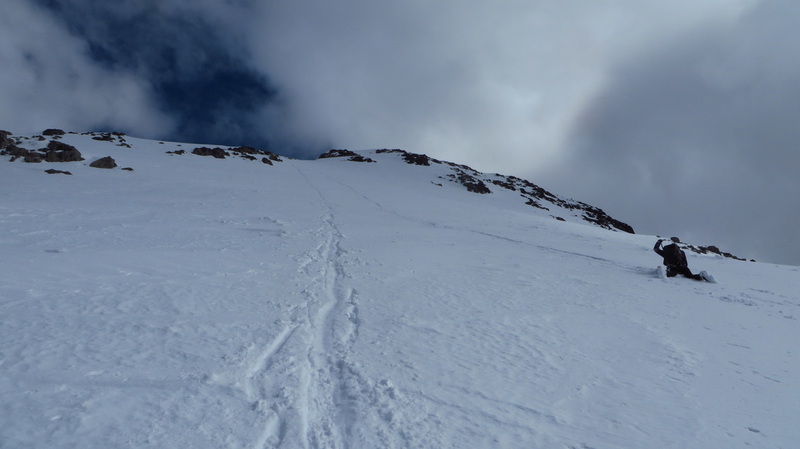 Here we decided we were comfortable unroped and slogged back to the steep hill leading back down to the upper lake. The hike back down the trail was uneventful, aside from when we reached the trailhead there was a couple guys looking for a ride to the nearest town since their truck flipped a mile or so down the highway and they needed a ride to a place with cell service. I would have offered to take them but we were completely full, so a couple of hippies who were cooking dinner next to their hippie van ended up taking them into town. 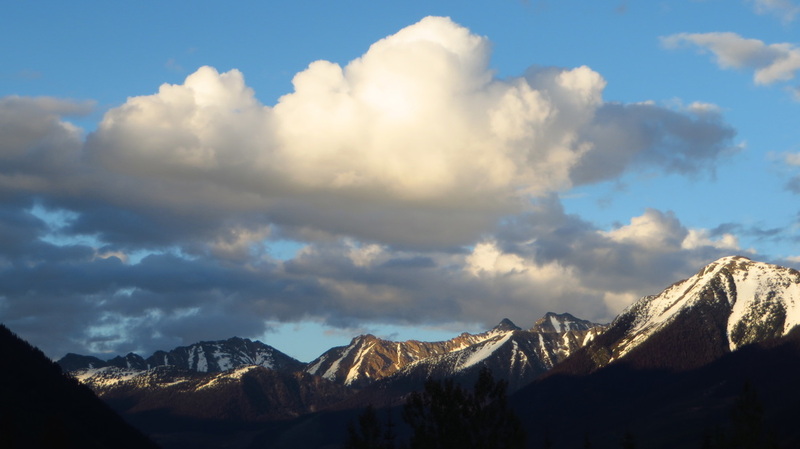 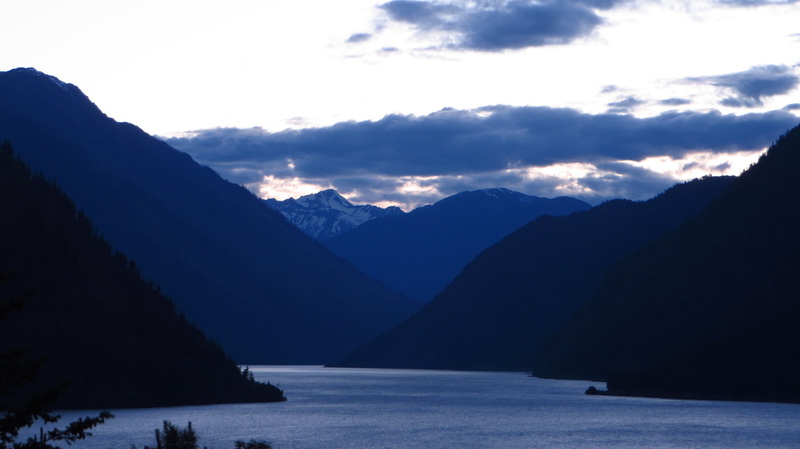 We continued on to Lillooet and had dinner at Subway and crashed on a dirt road just outside town.